To utilize the user dashboard first configure the global settings as you like from wp-dashboard→User Frontend→Settings→Dashboard. The Dashboard page has all global settings for user dashboards for your site. To learn about configuring this page, read this documentation. A user can see all his posts in his WPUF user dashboard. Create a page, e.g. Dashboard. To use single post type, insert this shortcode in the body of the page [wpuf_dashboard post_type="post_type_name"]. 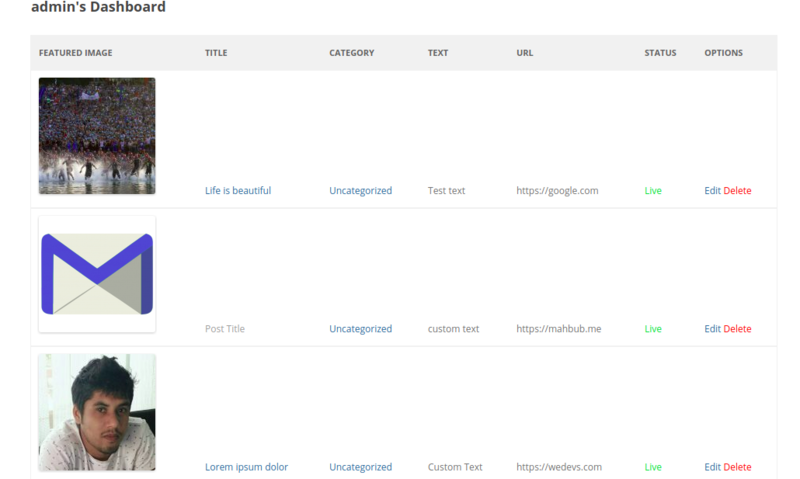 To allow multiple post types insert this shortcode: [wpuf_dashboard post_type="post_type_name, custom_post_type_name"]. 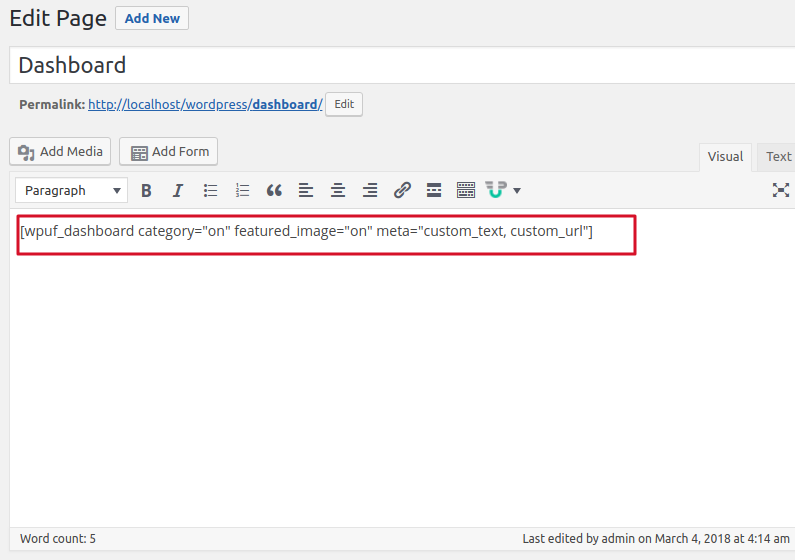 Now admin can customize the dashboard according to his needs by using some newly added attributes like ‘form_id' , ‘category' , ‘featured_image' , ‘meta' or ‘excerpt' . Admin can show only the posts of their preferred form by adding the form id’s inside [wpuf_dashboard] shortcode. As example, then we can show only the posts of certain forms with id 101, 102 then admin can use the shortcode as [wpuf_dashboard form_id="101"]. This shortcode will output default posts of WPUF Forms that contain id=101. Meta keys can be shown as [wpuf_dashboard meta="meta_key1, meta_key2"]. Category of the post can be shown as [wpuf_dashboard category="on"]. Featured images can be shown by [wpuf_dashboard featured_image="on"]. Excerpts can be shown as [wpuf_dashboard excerpt="on"]. The Payment attribute on Dashboard will be by default turned on. To turn the Payment column off, add the following shortcode to your Dashboard page: [wpuf_dashboard payment_column="off"]. And to turn it on again, use the following shortcode: [wpuf_dashboard payment_column="on"]. To configure how many posts will be displayed in a page, you can configure the settings at Settings→Dashboard→ Posts per page. There are other settings also for dashboard. Show the count of posts. Show featured image and set the size to display.